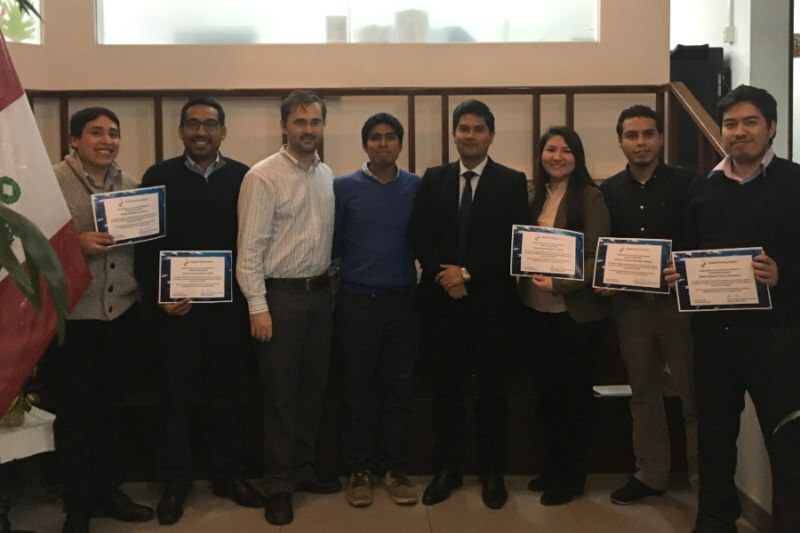 We were very pleased to complete a three day training session this month in Lima with the Peruvian Ministry of Production’s vessel surveillance division. It was an opportunity for us to share the latest developments on the Global Fishing Watch mapping platform and to get expert feedback from professionals in Peru’s fisheries sector. Since Peru’s public commitment in 2017 to show fishing activity from their Vessel Monitoring System (VMS) tracking data on our map we have engaged with local researchers and regulators to review and improve our data and analysis in the region. 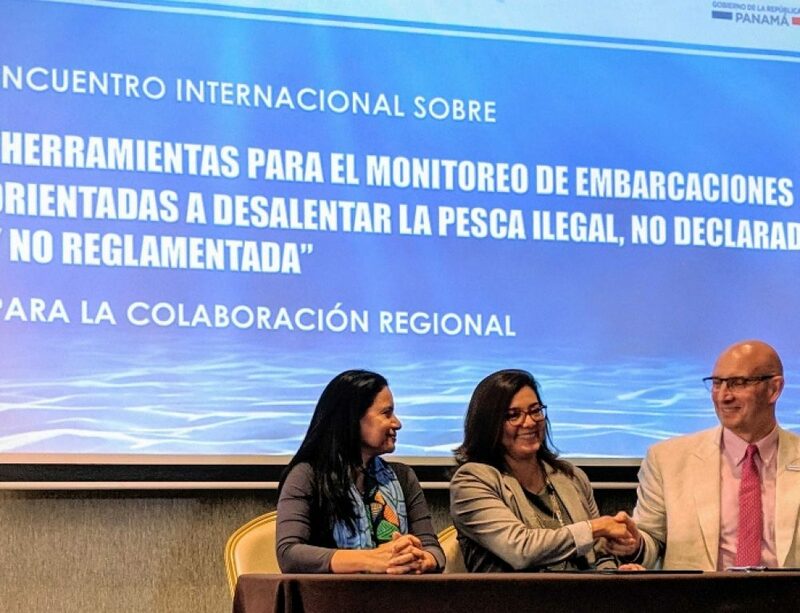 This began with a workshop with Peru’s Instituto del Mar de Peru (IMARPE) last December and now continues with Peruvian regulators directly responsible for daily monitoring of one of the world’s largest fisheries (Peruvian anchoveta). 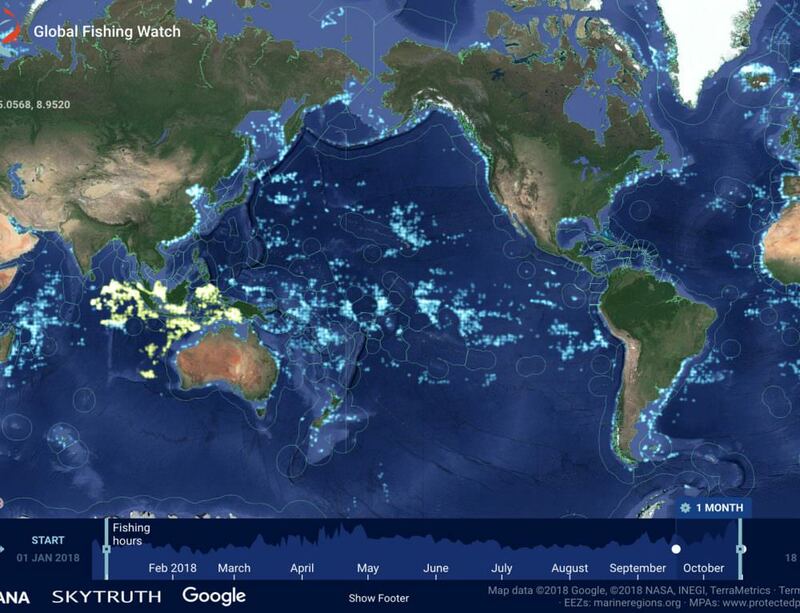 In our most recent training session we highlighted the benefits of being able to view and compare multiple data sources on the Global Fishing Watch map including the new night lights and encounters layers launched in June this year. Many large fishing vessels on the Peruvian coast are covered both by AIS and the Peruvian VMS system. In training, we compared the tracking data from both systems for the same vessel showing how one system may cover a gap in the other. The new night lights layer also has the potential to be very useful to regulators in combination with tracking data. A fleet of hundreds of Chinese vessels fishing for squid is expected to soon return to the Peruvian EEZ boundary. Individual fishing locations can be seen precisely due to the powerful lights they use to attract squid to the surface. However, to identify the fishing vessels, the night light information has to be combined with tracking and identity information from AIS. In training we identified a number of vessels in the Chinese squid fleet and followed their AIS tracks into port in Peru or to rendezvous with reefers (refrigerated cargo ships) where their catch is likely being transshipped. As we work to develop new tools and data sources for the Global Fishing Watch map it’s valuable to get the insights of fisheries regulators on how they would like to be able to apply our map. So it was great to be able to wrap up the training with a discussion on features that it would be useful to enable in the future. These included being able to select an area on the map with the mouse and display a list of vessels inside and downloading reports of past activity for individual vessels as they come into port. A special thanks to José Luis Herrera and Nilton Yarmas for coordinating the training. We also benefited greatly from the assistance of Eloy Aroni Sulca of Oceana’s Lima office who demonstrated many interesting potential applications of Global Fishing Watch in Peru. We look forward to hearing more in the future from participants in our training course and collaborating with them for successful monitoring and management of Peru’s ocean resources.